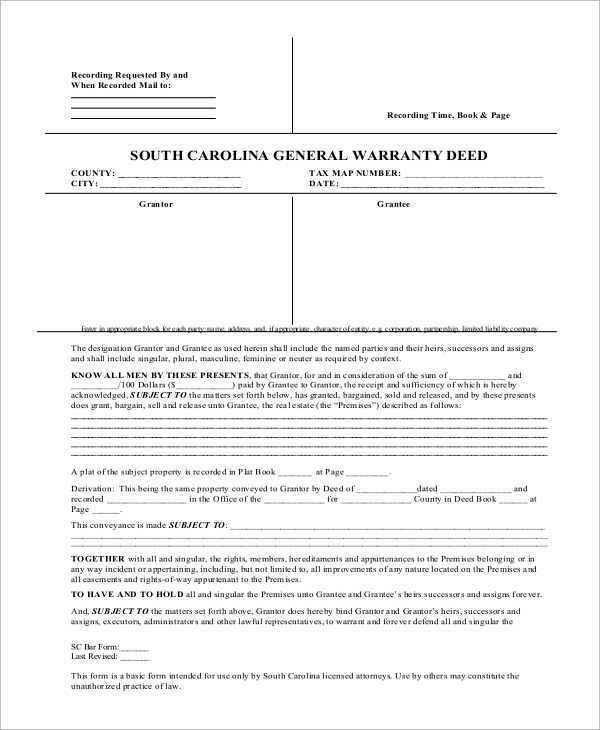 The general warranty deed types can be better understood with the Sample Warranty Deed Forms shared here. These samples will tell you how many styles of deeds can be made. And if you already have made one, you may compare with one online to see if you can add up more points for better deed making, or if your lawyer did the right job in framing the deed. In fact, if you are planning to make a deed, try using these examples and samples to frame a better one. 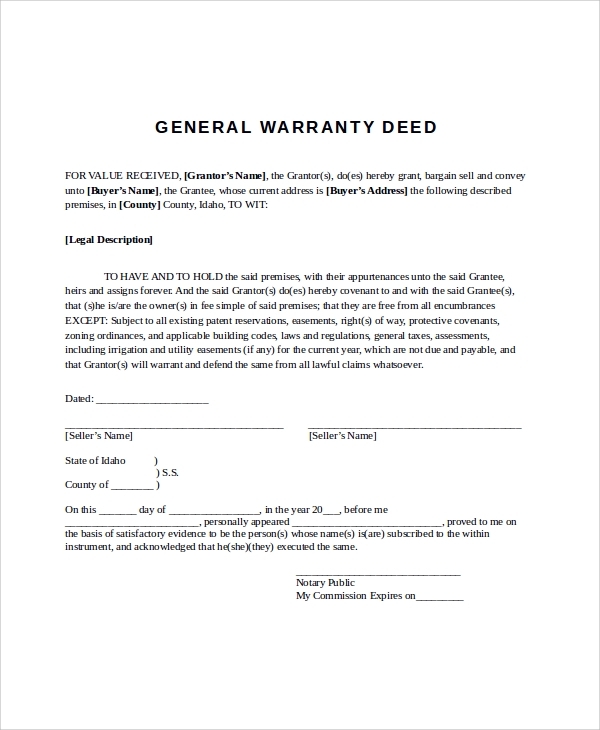 The general warranty deed form shown here gives you the right format for the deed form. You may directly use the format, and use ideas from it to frame one through your lawyer. 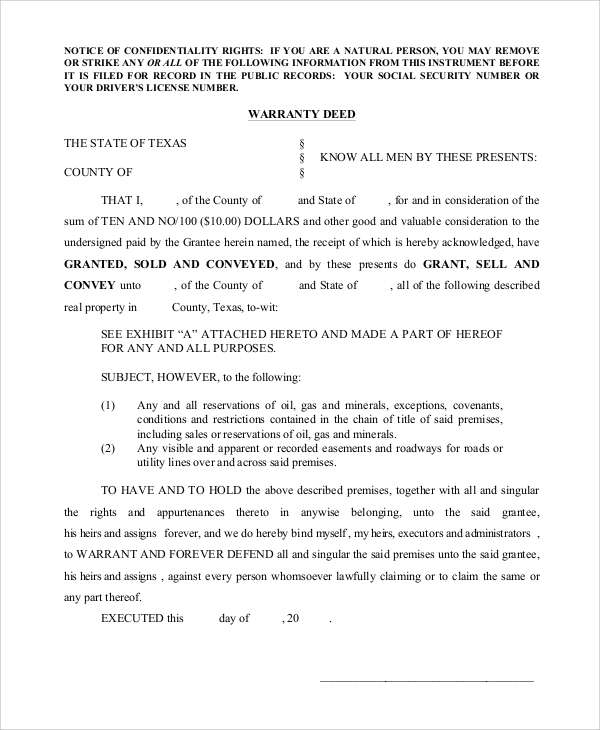 The real estate general warranty deed is typically used for real estate deals, where the seller makes the deed to help the buyer get a secured deal. This one is a great option for getting the right format. You may directly download and use the free to download blank format. 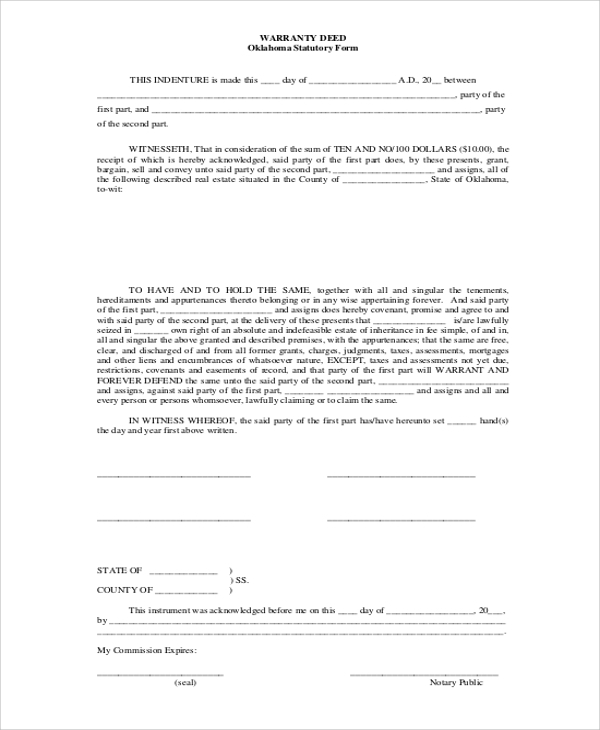 The blank format gives you more flexibility of designing by giving just the raw outline of a general warranty deed. 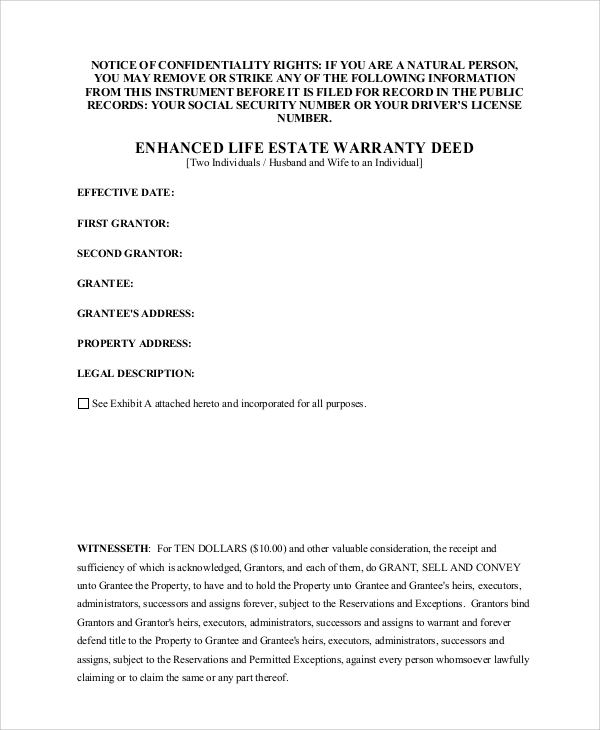 You may also see the Warranty Deed Form. 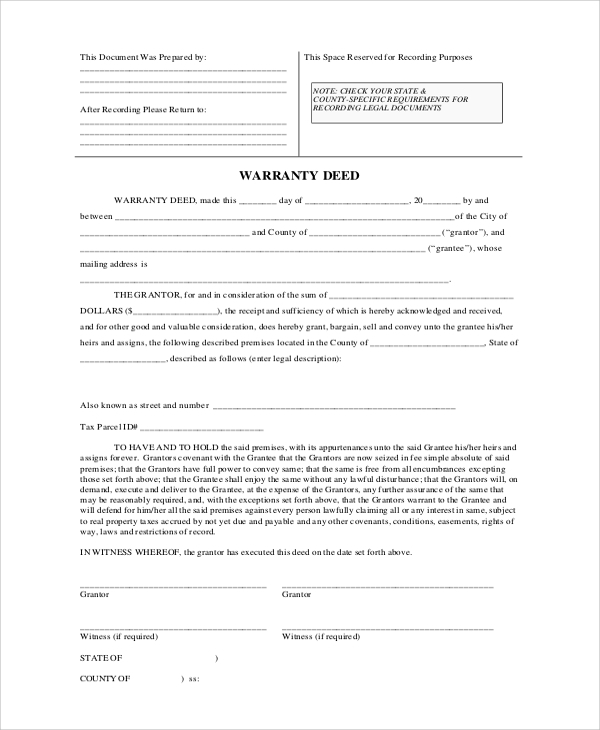 What is the General Warranty Deed? 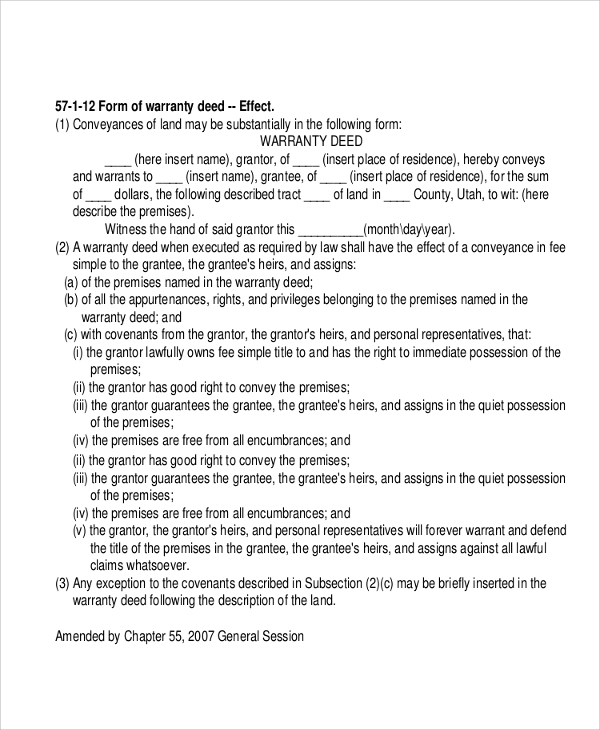 The general warranty deed is a much-used deed in the United States for buying and selling of real estate. In fact, in real estate transactions, the buyers can be made to feel the most secure when they get to see the general warranty deed, which frees them from any title dispute or other dispute of the property. The deed explains in plain words that the seller is the sole owner of the property, and owns the right to sell the property which is out of any legal or taxation disputes and that any problem with the property would hold the seller responsible. With many such points, the deed is a healthy way to deal with real estate. 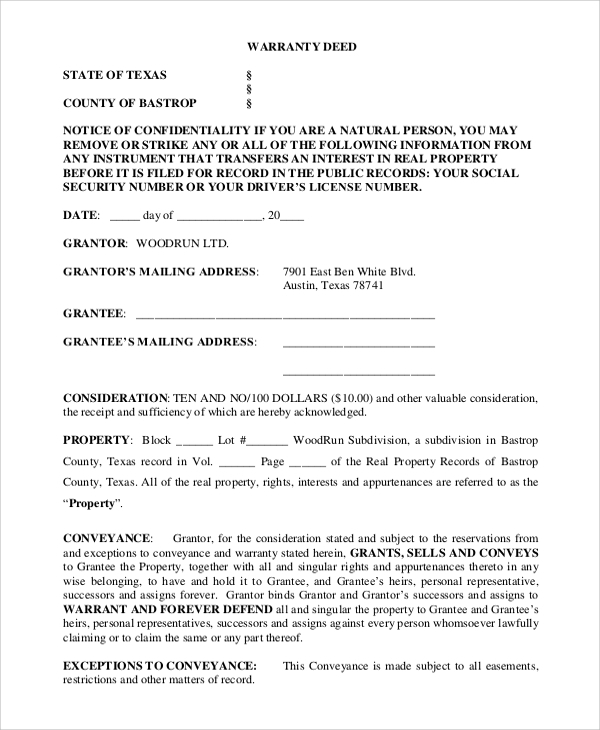 The confidentiality general warranty deed is one which is made for the retention of confidential data between the buyer and seller while the seller takes all liabilities. The general land warranty deed is made when there is no house or building on the land, and it’s just a piece of land that would be dealt with. The seller makes the deed for this land only using this format. You may also see the Quick Claim Deed Forms. The seller is the title owner of the property. The seller has the right to sell the property. The property was not sold to anyone else by the seller. All tax and dues are paid for the property except for any which are mentioned specially in the deed. In the case of any problem or dispute with the property, the seller would be addressable and liable. 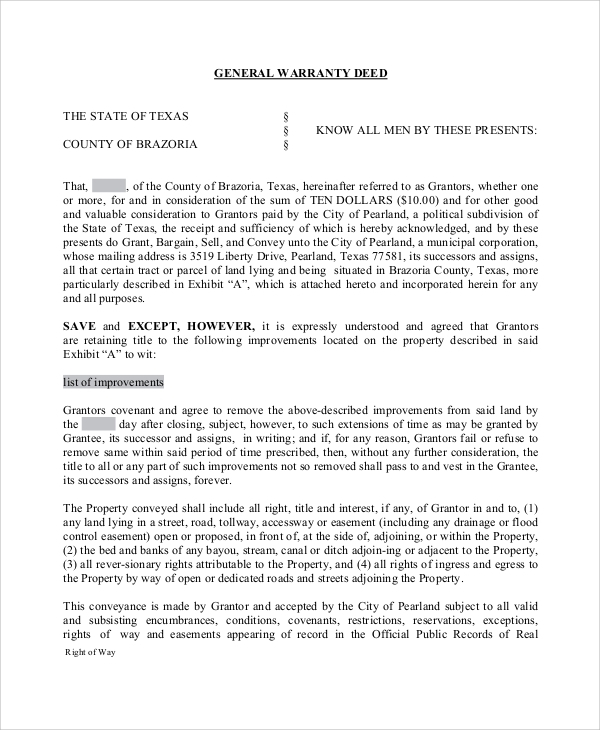 Since the general warranty deed promises so much for the benefit and security of the buyer, the deed is a must while real estate deals that the buyer must claim from the seller. If you want to make such a deed or want to know the various patterns, refer online for the samples. Also get ideas of the Deed of Release Forms online.